Another “canary in the mine” who is hopping around and singing! There is an urgent need for a feline CAGW brigade! Cats Against Global Warming-canaries. Thanks for making this paper available. 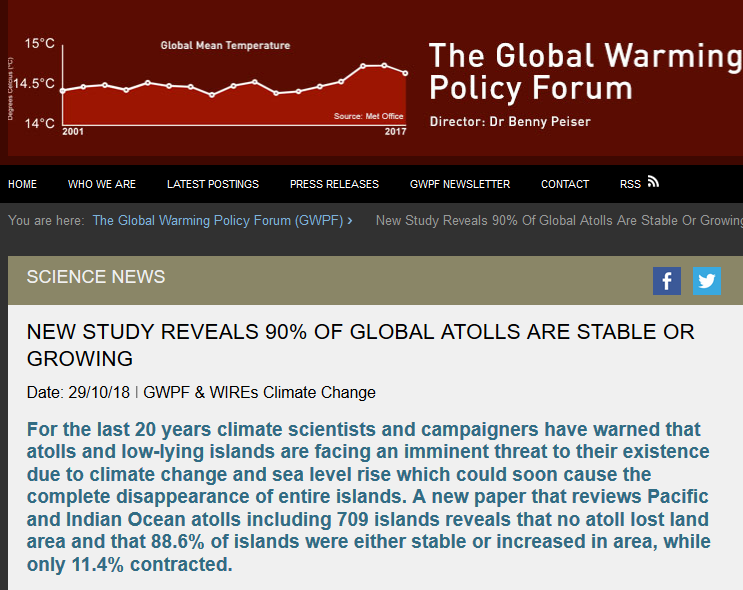 It should be brought to the attention of as many people as possible.The GWPF is doing great work. As I’ve said before without any scientific basis whatsoever, my gut says, marginally rising sea levels favour accretion, whereas lowering sea levels would probably favour erosion. You could argue this means not dredging up the sand for buildings, etc, but alarmists may see it as an opportunity to persist in the fantasy. They mention the Tuamotu Archipelago, the largest chain of atolls in the world , which is just to the east of the main islands of Tahiti. Taiaro atoll there is a rare example of a fully enclosed lagoon. Its about 7km in length and width. You would think if the underlying rock wasnt still sinking that this would be the most stable form. Alarmist killer paper. Those Maldivians who went viral conducting a meeting underwater wanted American taxpayers money ex ‘Paris Agreement’ to enlarge their airport- a cracking good investment. They built the new airport terminal anyway in spite of their claims it would soon be only suitable for flying boats and seaplanes. I went to Fiji recently, a bastion of global warming alarmism, they are still building on the shoreline. I guess the 250 million from the Green Climate Fund with another 750 million to come is a big incentive to scream climate change. Another spanner in the works for the climate scare machine. So far, the various spanners in the works have made the climate scare machine noisier. Incidentally, I have just received an Email from friends who moved last month to Southern Spain. They are huddled round the stove, sticking anything they can find into it, because it is almost unprecedently cold. You will not hear this on the BBC.